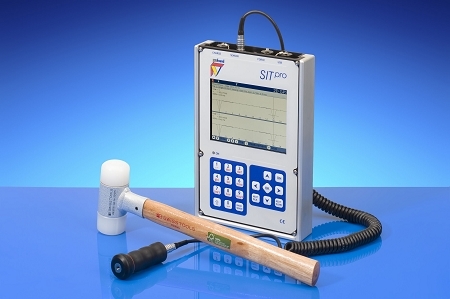 Sonic Integrity Testing of piles is performed with the SIT+ (Profound, Netherlands) equipment (see figure). This method is intended for quality control of both bored and driven piles. In case of bored piles, their integrity, the existence of cracks, neckings or extensions are controlled, while in case of driven piles, mainly the significant cracks and split-offs of the pile are identified. This method can also be used quite successfully to determine the length of already installed piles (in earlier years) but for which no technical documentation has been preserved. Length determination accuracy is within 10%. The processing of results and the interpretation of echograms are carried out in the "Profound SIT version 7.98" program developed and licensed by the equipment manufacturer. Pile length (in most cases). The picture below shows defects that can or cannot be detected during the mentioned pile inspections. With this method, 150-200 piles can be inspected on a construction site within one working day. Testing of the CFA pile (diam. 1180 mm, L=25 m) in Riga. Below are some examples of pile defects detected by this method, visually confirmed after the pile excavation. A defect (necking) was detected at the depth of about 2.5 m from the pile head (Ventspils, Latvia). A defect (necking) was detected at the depth of about 2.0 m from the pile head, as well as a serious, vertical crack (Riga, Latvia).